The Campaign for Housing and Community Development Funding (CHCDF) is an education, strategy and action hub led by NLIHC. The coalition of more than 70 national organizations work to ensure the highest allocation of resources possible to support affordable housing and community development. CHCDF’s members represent a full continuum of national housing and community development organizations, including faith-based, private sector, financial/intermediary, public sector and advocacy groups. CHCDF holds biweekly forums and meets with decision makers to promote the importance of federal funding for affordable housing and community development programs. 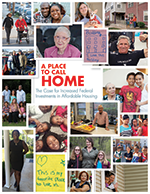 A Place to Call Home, a Campaign for Housing and Community Development (CHCDF) report, highlights how federal investments in affordable housing and community development have a positive impact on low income households and the U.S. economy. Increasing and preserving access to affordable housing in areas of opportunity helps families climb the economic ladder, leading to greater community development and bolstering economic productivity and job creation. Despite their proven track record, affordable housing programs administered by the U.S. Departments of Housing and Urban Development (HUD) and Agriculture (USDA) have been chronically underfunded, while the need for affordable housing continues to grow. More families now spend the majority of their income to keep a roof over their heads, family and young adult homelessness rates are rising in many communities, and much of our nation’s affordable housing infrastructure is deteriorating. Every state and congressional district is impacted. Looming budget cuts required by the Budget Control Act of 2011 threaten affordable housing and community development investments and millions of low income families. For these reasons, CHCDF calls on Congress to lift the spending caps with parity for defense and non-defense programs and to ensure the highest level of funding possible for affordable housing. For more information, contact Elayne Weiss at eweiss@nlihc.org or 202-507-7462.